The Palladium American Eagle coinage debuted in 2017 with the release of the coin’s bullion version for investors. After one year on its own, the bullion coin is now joined by the Proof Palladium American Eagle for collectors. With a limited mintage of just 15,000 coins, these specimens will sell out quickly! 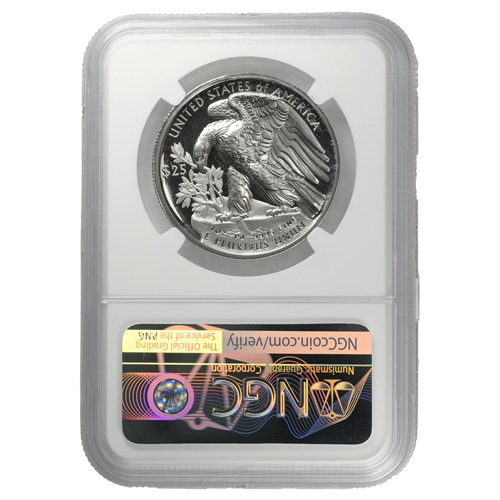 Right now, 2018-W 1 oz Proof Palladium American Eagle Coins are available to purchase online at Silver.com with NGC certification. Availability of certified coins is limited within the 15,000-coin mintage! On the obverse is Winged Liberty. Art from Adolph A. Weinman. Each of the 2018-W 1 oz Proof Palladium American Eagle Coins in this product listing comes to you with a perfect certification from the NGC. Coins with a PF70 certification exhibit full, original mint luster and have no detracting flaws of any kind. The included Early Release label is available as well and notes that each coin arrived for certification within 30 days of its 2018 release by the United States Mint. Palladium American Eagle Coins feature obverse and reverse designs from Adolph A. Weinman. A student of Augustus Saint-Gaudens, Weinman is credited with creating two of the nation’s greatest coin designs of all time. His Walking Liberty depiction was on the half-dollar coin from 1916 to 1947, and is today found on the Silver American Eagle. Now, his Winged Liberty design graces a second coin as well. The obverse of 2018 Palladium American Eagle Coins features the effigy of Winged Liberty. Designed in 1916 by Weinman, this design originally featured on the circulation US dime from 1916 to 1945. Today it is the design of the Palladium American Eagle coin and captures Liberty in left-profile relief with a winged Phrygian cap. On the reverse of 2018-W 1 oz Proof Palladium American Eagle coins is another design from Weinman. This one originated on the American Institute of Architect’s Gold Medal issued in 1907. It depicts a bald eagle at rest on a cliff’s edge with a tree branch clutched between its talons. If you have any questions about the Palladium Eagle, please don’t hesitate to ask. Silver.com customer service is available at 888-989-7223, online using our live chat, and via our email address.